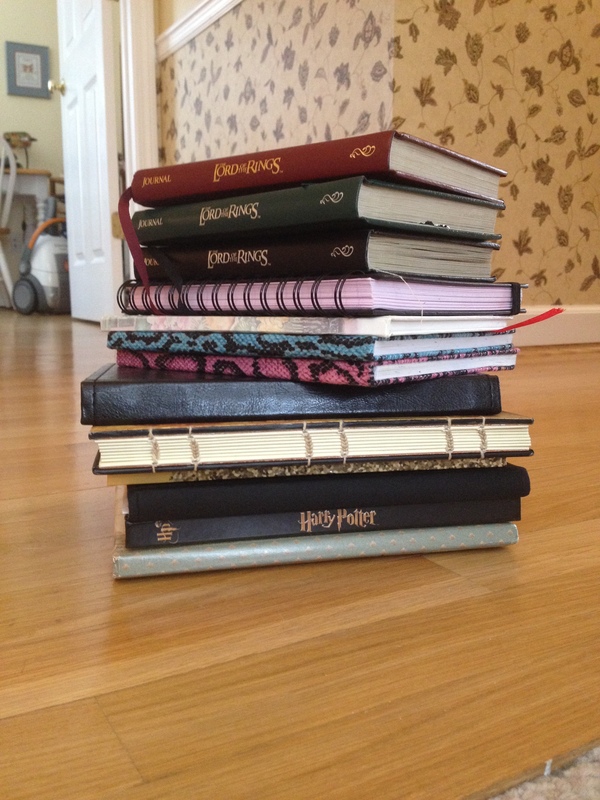 journals, diaries, and poetry, oh my! I’ve always been a little obsessed with handwriting journal/diary hybrids, books where I’d talk about my day and daily dramas and then suddenly launch into discussion of some bigger, deeper theme out of nowhere. I started when I was around 11 or 12 and continued (albeit very intermittently) into my twenties. As I went through college and beyond, the gaps between my journaling increased. I have years that are not recorded at all, where others I’ll experience a burst of activity and then drop off the face of the earth again. I also fell in and out of love with journaling. Sometimes I was really enthused about it, while others I felt it only served to make me realize how uninteresting my life was. I also noticed that as I got older and life obviously became more complex as a result, I became less honest in my journals, which was upsetting to me. Journals were supposed to be a place I could come and be completely honest with myself, not to skip around anything I didn’t want to face head on in order to make better, more nostalgic reading for myself when I came back to them later. Last year, one of my New Year’s Resolutions was to write some in a journal every day, a sort of final challenge to see if I could do it. For a while (nearly 3 months) it went well, and I managed to get something down every day, even enjoyed it the majority of the time. But one thing I’d failed to account for was that it did take time. I liked to handwrite all my journals and my insistence on doing it every day was taking away from the success of another one of my goals: to write poetry on a regular basis. I write poetry in the same way I write journals, by hand, and a lot of the time when I was done with my journaling, especially if the entry had been emotional or particularly deep or searching, I found my well all dried up when it came to poetry. Not only that, but some of the entries in my journals became downright poetic when I really got going on something I couldn’t really articulate. It wasn’t the first time I’d noticed this strange melding. In fact, back in 2012 I wrote an entry in which I wondered if poetry and keeping a ‘diary’ weren’t so different as I’d first assumed in terms of purpose. Being that I valued poetry more, I started to wonder if maybe I should make poetry my diary of sorts, and write daily in some poetry book rather than a journal. Poetry is like pouring out feelings you can’t even put into words, and that’s what I like having a diary to be about too, but I don’t know…if someone were to read a diary, they might be hurt or troubled by what they find- but with poetry…poetry is always under the guise of art. The words are not straightforward, so even if you write something in the heat of hateful feelings, it might be construed differently by the very person it’s about. It might be enjoyed by them, and then, assuming the poem is for poetry’s sake as well, long after your angry feelings pass, you can still love the poem, unlike how you’d be ashamed of an angry journal entry. Because poetry is beautiful, and transcends something base inside, so that sometimes in the act of writing it we come to reconcile our emotions and achieve insight into the deepest reaches of ourselves. Poetry can be therapeutic indeed. When I journaled, I felt like a lot of what I wrote as boring, and I always felt like I missed writing about the real ‘good stuff’. With poetry, the only things you take from life are the ones that strike you in some way, the moments that seem to glow with a special sort of luminescence. So while my poetry will never tell me what I ate yesterday morning or what test I passed or what inside joke I created, it will take me back to the memories that matter most upon reading, memories only I can fully unlock. And as a bonus, it will hopefully be something completely new and different to each reader who sees it, as any good piece of art is. Do I still journal? Occasionally, but only when the spirit moves me. Poetry has by and large taken the front seat in my handwritten life ;).